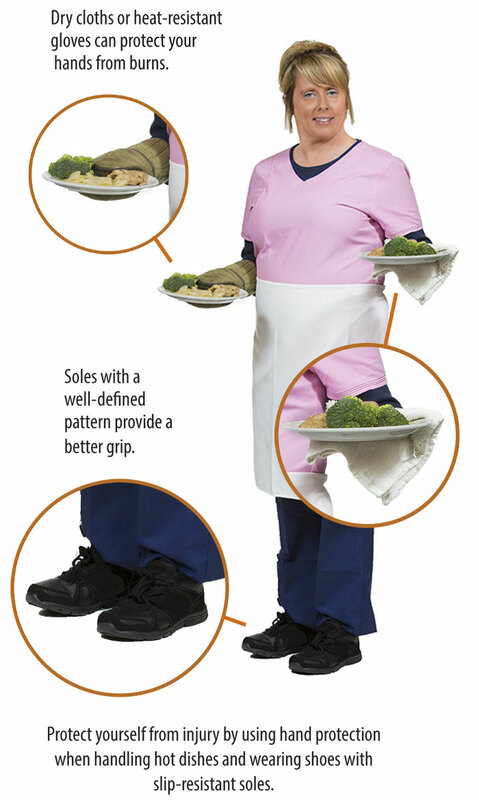 As an employee in the food service industry, choosing the right footwear and clothing can help keep you comfortable and protect you from slips and falls, burns and scalds, and sprains and strains. Your footwear must be appropriate for the type of work you do and be maintained in good condition. To prevent slips, trips, and falls on floors slick with food, water, grease or oil, wear footwear with slip-resistant soles. To prevent burns and scalds from spilled, hot liquids that can burn through canvas and melt artificial materials such as nylon or polyester into your skin, choose footwear with a closed toe and a solid leather upper without a pattern of holes. If you lift, carry, push, or pull heavy objects such as large food containers, you must wear approved slip-resistant safety footwear with toe protection. Consider low heels, which may be more comfortable for standing, walking or climbing stairs and ramps. When handling hot dishes, plates or trays, use hand protection such as dry cloths or heat-resistant gloves/mitts. If you work outside, serving on an outdoor patio, for example, wear appropriate clothing and footwear for the conditions. Sunglasses and sunscreen should also be worn for protection from UV rays. Before using a hazardous product or substance such as a cleaning agent, you must be trained to use it safely and wear the necessary personal protective equipment. Check the safety data sheet (SDS) and the label on the container to see what personal protective equipment is required, such as gloves, and appropriate for the chemical.